79.6% of on-site generated construction waste was diverted from landfills. Certified LEED-CI Gold in November, 2009, Schreiber Lab is a 1,700 square foot Chemistry Lab, located on the 1st floor of the Naito Laboratory Building at 12 Oxford Street in Cambridge, MA. The Naito Laboratory building, a fourstory structure constructed in 2000, is one of the four buildings housing all 278,000 sq. 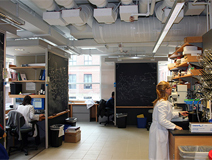 ft of laboratories for Harvard’s Department of Chemistry and Chemical Biology, located within the Cabot Science Complex. Harvard’s Green Building Guidelines and the LEED-CI rating system guiding the selection of materials and the mechanical, electrical and plumbing (MEP) systems for the project.